What are my options after being injured as a passenger in a motorcycle accident? ?How can I prove that a driver caused my motorcycle crash? ?How is my motorcycle crash claim different from other accident cases? ?Before I buy a motorcycle, what should I know about the risks and potential injuries an accident may cause? If you've been injured in a motorcycle accident, you're entitled to compensation for medical expenses, lost wages, and pain and suffering. However, the first step in your personal injury claim will be determining who is liable for the incident. 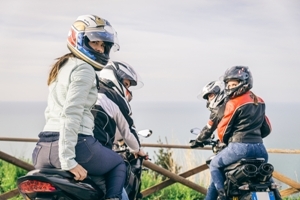 Who Is Liable for a Motorcycle Passenger's Injuries? Motorcycle operator. If the motorcycle was the only vehicle involved in the accident or the operator was responsible for causing a multi-vehicle accident, your claim will most likely be against the person you were riding with. Driver of the other vehicle. If another driver caused the accident, his insurance should pay for your injuries. Both the motorcycle operator and the other driver. If both parties are found partially at fault for the accident, it may be possible to file two claims to receive full coverage for your damages. Motorcycle manufacturer. If a defect in the motorcycle caused the accident, you can sue the manufacturer for your injuries. Motorcycle mechanic. If the motorcycle wasn't repaired correctly and faulty brakes or other mechanical problems contributed to the accident, the mechanic or owner of the repair shop may be responsible for your damages. State, county, city, or town. When a motorcycle accident is caused by potholes or other road defects, the agency responsible for maintaining the roads can be held financially liable. Accident reports, witness testimony, and experts who specialize in accident reconstruction can be used to help determine liability for your injuries. In most cases, passengers aren't considered at fault for their own injuries. However, if you were riding with an operator you knew was impaired or otherwise unqualified, the insurance company might try to argue that you're partially responsible for your damages. You might also be found partially at fault if you made any sort of sudden movement that jeopardized the operator's ability to safely control the motorcycle. Fortunately, you can still collect compensation for your damages as long as you are found to be less than 50% responsible for the accident. Griffith Law is committed to helping injured passengers receive compensation for their motorcycle accident injuries. To learn more or schedule a free, no-obligation case review, please call our Franklin law firm at 615-807-7900 .